If you’re looking for a bike that’ll be right at home on off-road trails, then look no further than a mountain bike. They’re specced and designed to take on the toughest mountain terrain and range from really affordable price points. You’ll notice as bikes get more expensive, there’s a vast difference in the components used. There are several features you want to look out for when investigating mountain bikes. Nature gears mountain bikes for off-road terrain. They have wider, knobblier tires than those found on the standard road bikes. Off-road, tires are designed to give you more grip efficiently on the rocky, rubbly surfaces and come in a variety of rim sizes including 26, 27.5 inch (or 650b, as they’re known in the industry). Some riders prefer bigger, faster wheels like the 29-inch wheels of the 29er, though this is a personal preference. The mountain bike you go for depends on what you intend to do with it. If it’s speed you’re after, a cross country bike will be ideal. It’s light, fast, and the aerodynamically designed frame is quick to ride and comes with front suspension. If you ride a lot of roads or relatively smooth, flat surfaces, you may benefit from a bike with lockouts on the suspension because once it’s locked out, the frame becomes completely rigid it doesn’t absorb your energy as you pick up the pace. The lockout feature is usually found on mid-range mountain bikes or better and is also handy when riding the steeper inclines. The big question in mountain biking is: which is better? The hardtail or a full-suspension? The full suspension bikes offer more absorption, which makes them better suited to harder terrain than the hardtail bikes plus, it helps take on those big jumps and fast, rough trails. However, many lovers of the hardtail bikes argue that the greater feel from a rigid frame more than makes up for the lack of comfort of the rear suspension. Plus, there are fewer components on a hardtail bike, meaning it’s often lighter when you compare it to that of a full suspension MTB. Either way, both bikes have significant advantages. So at the end of the day, it’s down to which best suits your needs. The more expensive mountain bikes offer disc brakes, which are both hard wearing, responsive and extremely efficient at bringing you to a complete stop smoothly and safely. V-brakes are ideally suited for the lighter off-road riding and are often found on entry-level bikes. They are strong and responsive, but the difference in performance becomes evident as you step up the range to mechanical disc brakes and hydraulic disc brakes. As you can see, there’s quite a visible difference in the way the two braking systems operate. Disc brakes are heavier and more expensive than V-brakes but offer more stopping power working better in severe weather conditions. Hydraulic disc brakes are often considered an upgrade to mechanical disc brakes due to their rapid response and smooth and accurate performance in any situation. Well, it’s vital that when you have to shift gears, they change efficiently and precisely. The better the quality of components used in the gearing, the quicker and smoother the gears change. So, how many gears do you need? 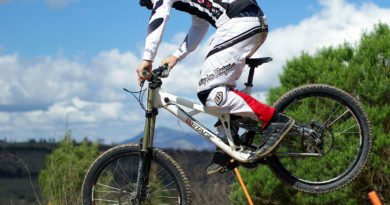 Conventional mountain bikes have a range of 21 gears to choose from, while other bikes can have up to around 27 gears. But more isn’t always better, and the mix of speeds between the rear and the front derailleur give you an indication of the range you can expect to have at your disposal. One thing’s for sure: you can feel the quality of the components increase as you move up the range. How to Get Over Logs on a Mountain Bike?